German translation for the Silence is Golden Guard WordPress plugin is available with version 1.6 at May 19th, 2010. Thanks to Tom for the help. Do you have SIG Guard plugin translation in some other language? Share it with other WordPress users. Some new phrases in existing SIG French and Spanish translation files still need to be translated. Do you wish to help? You are welcome! Italian translation for the Plugins Garbage Collector WordPress plugin was available first time at May 12th, 2010 with version 0.5 and updated at May 18th, 2010 with version 0.5.2. Thanks to Alessandro Mariani for the help with making Plugins Garbage Collector WordPress plugin available for italian users in their native language and continued support. Do you have PGC translation in some other language? Share it with other WordPress users. Some phrases in PGC translation files still need to be translated. Do you wish to help? You are welcome! Exciting news! WordPress 3.0 becomes nearer and nearer. May 6, 2010 WordPress development blog announced WordPress 3.0 beta 2 availability and left a word about release candidate :). * Changes to the WordPress exporter and importer to make it more flexible. If you wish to test WordPress 3.0 beta 2 you can download it here. Let’s see together what we can do with new WordPress 3.0 built-in menu system management interface and how to use it. Example and screenshots use the new WordPress 3.0 default Twentyten theme. Next update v.1.5 is available for Silence is Golden Guard WordPress plugin. With the help of plugin users incompatibility with WP Super Cache plugin was discovered and fixed. The problem was that blog with WP Super Cache plugin active becomes unavailable after activating of SIG plugin. Analysis showed that index.php file with redirection directive in the wp-super-cache/plugins directory results in the endless redirection loop which block the blog front-end and admin back-end access. From version 1.5 SIG plugin checks if WP Super Cache is active and create then empty index.php file for the wp-super-cache/plugins directory without redirection directive. The incompatibility issue is resolved this way. 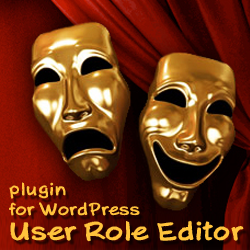 Italian translation for the User Role Editor WordPress plugin is available with version 2.1.4 published at May 8th, 2010. Thanks to Talksina for the help with making User Role Editor WordPress plugin available for italian users in their native language. Do you have URE translation in some other language? Share it with WordPress community. Some phrases in URE translation files still need to be translated. Do you wish to help? You are welcome! 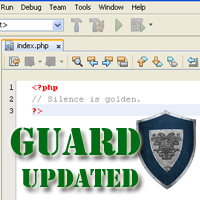 Next update v.1.4 is available for Silence is Golden Guard WordPress plugin. Checking if index.php file is SIG Guard plugin made file and can be rewritten is updated/enhanced in try to exclude rare cases when SIG Guard rewrites important index.php file, e.g. in the current theme folder. SIG Guard own stamp string verification is added. File with more than 4 rows will not be changed too.